Emily and Steven’s romantic St. Pete Beach wedding featured an outdoor waterfront wedding ceremony, followed by a ballroom reception with a timeless color palette of navy, gray and pink. The St. Petersburg couple wanted a wedding venue that had meaning behind it an chose one of the most iconic hotels in Tampa Bay. The couple searched for a St. Petersburg wedding photographer who could help guide them through a hectic wedding day and capture all of the candid moments, while still taking beautiful portraits. Looking back, Emily’s most memorable moment occurred because of a suggestion from her wedding photographers. “After our portraits on the beach were done, Caroline and Evan told us to take a moment and watch the sun set. 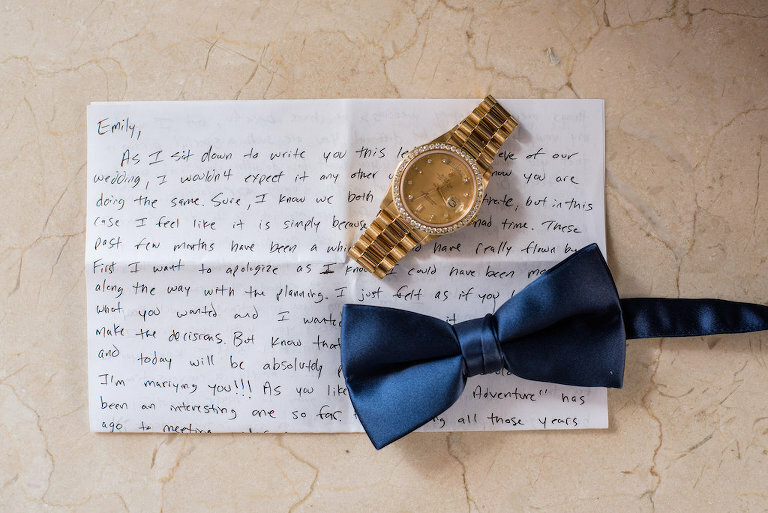 It was perfect,” the bride reminisced. Steven proposed at our home! He told me a couple weeks leading up to our proposal that we were going to go out to dinner with some of his coworkers, giving me a chance to wear a new dress I got for my birthday that I was dying to wear, but had no where to wear it to! As we were getting into his truck, he told me he forgot his wallet inside and went back into our house to find it. Little did I know that he was setting up rose petals and getting our dogs outside so he could pop the question! He called me after a couple of minutes asking if I could come in and help him, and when I opened the front door, he was down on his knee! Romantic, beach wedding. Our inspiration came from the romance of our wedding venue and the natural beauty of the beach. I wanted to pull from nature when it came to my decorations and the men’s boutonnières, as well as the bridal parties outfits. Navy, gray and pink. 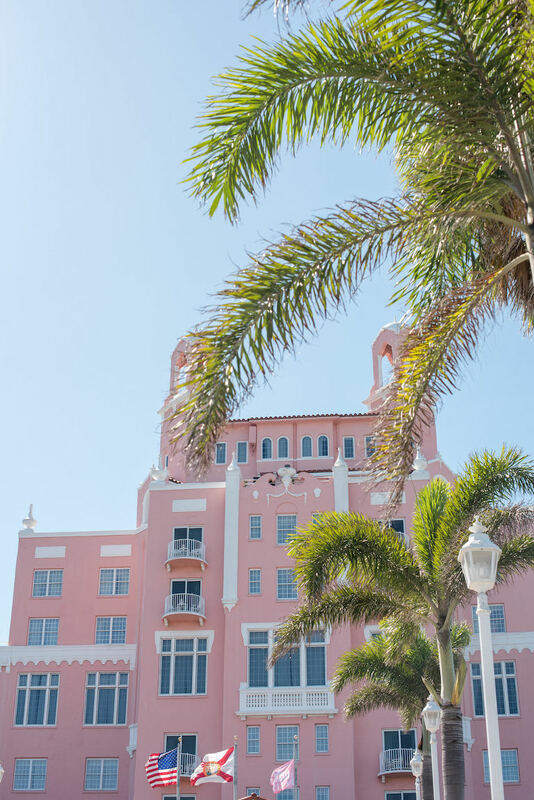 I didn’t want there to be too much pink in my decor or bridal party because of The Don CeSar being pink; I didn’t want to take away from that. There were subtle hints of pink in our bouquets, my ring children and flower girl and my shoes. We decided on The Don CeSar because I grew up telling my dad that I was going to get married there. I wanted to be a princess with a big dress and pink shoes. Luckily I was able to live out those childhood dreams with my prince! The Don CeSar is a beautiful, classy, and historic building. It’s the closest thing to a castle that we have in St. Petersburg; it was my dream. I thought their service and staff people did an amazing job. They were incredibly helpful and always willing to answer all our questions! Someone who was willing to help us through this process! We literally had no idea what to expect or how our day would look. We wanted someone who took beautiful pictures and caught all our silly candid moments! Caroline & Evan Photography were honest and genuinely kind people. From our engagement shoot at 6 a.m., dealing with our dogs and the three different locations and outfit changes I wanted, they went with the flow. But they also helped guide my crazy kindergarten teacher brain into what would look the best. Evan was not only a photographer the day of our wedding, he also helped dress all the groomsmen. Caroline was a joy and a calm presences in the crazy bridal room. Honestly we didn’t know who to start with. With the help of our wedding photographers and venue, they were able to point us in the direction of The Artistic Whisk! Jovana was of The Artistic Whisk was amazing! She made delicious cakes and working with her was seamless. Not to mention, she is a wonderful girl!